General Santos City is a progressive city that boasts of modern amenities and natural attractions just a short distance from its center. The city is one of the most industrialized in Mindanao and is considered the commercial hub of the SOCCSKSARGEN Region. If you’re planning to visit General Santos City and is looking for an affordable place to stay, I recommend Tierra Montana Hotel. Tierra Montana Hotel is located at the heart of General Santos City, along the National Highway. It’s an easy distance from SM City GenSan as well as other shopping and dining spots. If you’re coming from the downtown area, you can ride a tricycle or a cab to take you to the hotel. The hotel is somehow “hidden” behind a commercial building that houses several businesses so you might have to keep an eye out for the DHL signage. It was a pleasant surprise to find the cozy little hotel in the city center. 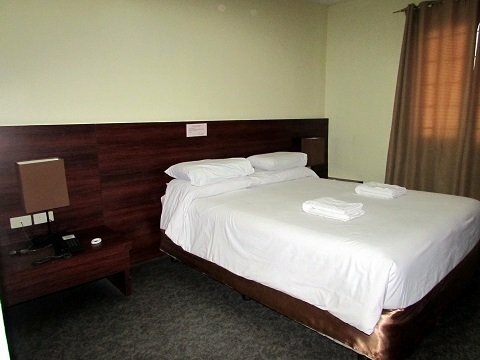 For an affordable hotel, Tierra Montana is a classy choice of accommodations for General Santos City visitors. 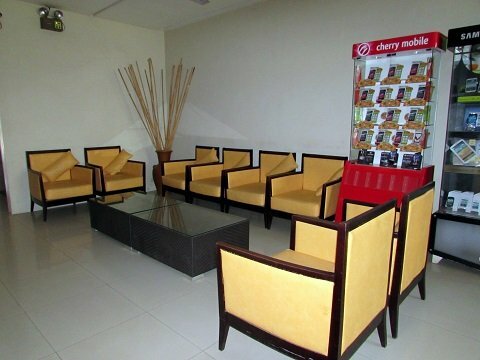 Though small and simply-decorated, the reception area is comfortable and airy and the front desk officer is happy to assist with check in and other concerns. Simple yet welcoming reception area. The ever-smiling front desk officer. 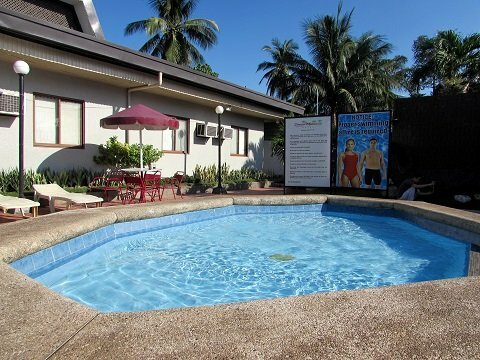 Tierra Montana Hotel also features an outdoor pool with a hot tub, offering a welcome respite from the GenSan heat. Right by the pool are sun beds and tables ideal for al-fresco breakfasts. Tierra Montana takes pride in their gorgeous, chemical-free pool which we indeed enjoyed during our stay. 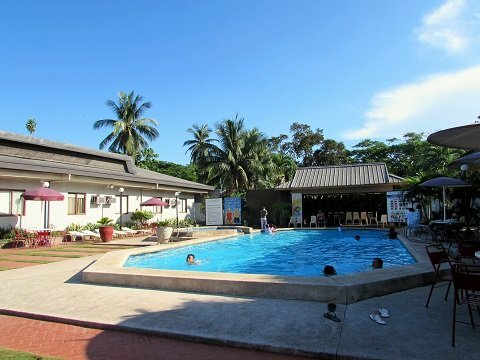 Guests enjoying the pool in the GenSan heat. Of course nobody paid attention to the hot tub. Close to the pool are a couple of function areas. These are ideal for small to mid-sized gatherings or conferences. The hotel can setup catering and tables according to guests’ requirements and they have a sound-system and technician to take care of things during an event. Although the hotel is close to several good dining spots in the city, guests need not venture out for a good meal if they prefer. The hotel has a pool-side restaurant that also offers room service. There is also the Blue Room KTV Bar that opens during evenings and right beside it is a mini-casino where guests can play e-games. I did not get the chance to check out these places except for when we had breakfast but I did notice a lot of people milling about in this area of the hotel at night. Outdoor seating right by the Blue Room KTV Bar. Tierra Montana Hotel offers guests the choice between standard rooms and suites. Standard rooms come with either twin beds or a matrimonial bed. Suites have a single-sized and a matrimonial bed and have more breathing room. 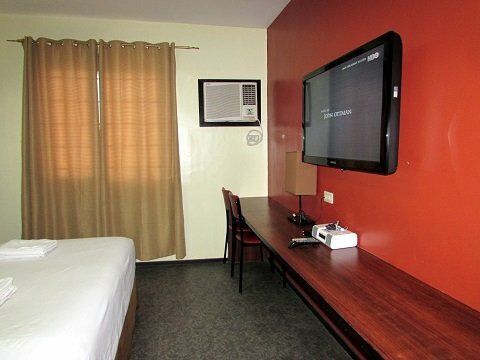 All rooms at Tierra Montana Hotel are equipped with air-conditioning, flat-panel LCD TVs with cable channels, hot and cold showers and direct-dial phones. Suites have the addition of a refrigerator. An iPod/iPhone dock is provided and there is ample space for working on a laptop. Wireless Internet connection is available in all rooms and public areas within the hotel premises. In-room massage can also be availed at an extra per-hour charge. Tierra Montana Hotel has round-the-clock entry and roving security so you’ll feel safe during your stay. The front desk is also manned at all times to cater to any guest request; you can also leave valuables at the front desk for safe-keeping as rooms do not have built-in safes. If you’re a foreign traveler who needs a local means of communication, there are several low-end and high-end phones for sale at the front desk. Other items like toiletries, snacks and simple electronics are also available. Guarded parking is available just outside the hotel’s main entrance. I must note that space can get scarce when the hotel is hosting an event and you may have to park in front of the commercial building by the National Highway. Tierra Montana Hotel is an excellent choice of accommodations for both business and leisure visitors in General Santos City. Not only are their rates very affordable, they provide services that go well beyond that of other hotels of the same class. It’s a hotel that offers great value for your money and I highly recommend staying here if you’re on a budget but would not want to sacrifice the quality of your accommodations. 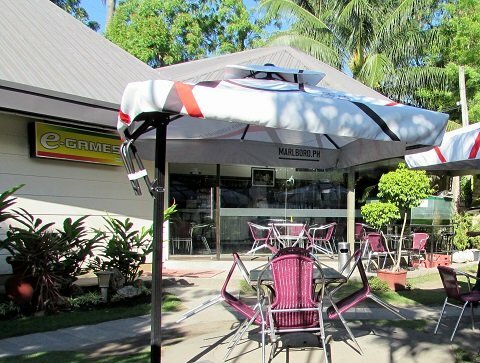 Have you stayed at Tierra Montana Hotel in General Santos City? Let us know about your experience in the comments below!